In 2005, Daniel Tucker founded AREA Chicago, an organization whose publications and events serve the double mission of researching art, education, and activist practices within the city of Chicago. Tucker recently announced his departure from the organization, but he’s been keeping busy. He collaborated on a book called Farm Together Now with co-author Amy Franceschini and photographer Anne Hamersky. The book (available in late November from Chronicle Books) documents a road trip across the country in search of alternatives to our current food production system. TMN: What prompted you to create AREA Chicago in the first place? Daniel Tucker: From 2000 to 2005, I experienced some really powerful collaborations in Chicago where artists and activists were developing creative responses to the rapid privatization and gentrification of the city. (These projects are all documented in a booklet that I co-edited called Trashing the Neoliberal City: Autonomous Cultural Practices in Chicago from 2000-2005 which is available for download here or for purchase from Half Letter Press.) Those experiences gave me a sense that the complexity of today’s urban environments really required unconventional collaborations between grassroots community activists and people with backgrounds in research, design, art, and media to come up with different ways to analyze, frame, and address problems city residents were facing from the crumbling infrastructure of the old welfare state to the social- and economic-justice issues of mass displacement and incarceration. After several years of being a direct participant in these kinds of creative gestures I was convinced that what the city needed was some kind of device in which to document all this amazing activity happening in Chicago that represented these unconventional practices, as well as something that could encourage their proliferation and critical reflection. So I got a number of the people I had met through previous projects in the same room (representing groups and organizations like Video Machete, Pilot TV, Temporary Services, and Neighborhood Writing Alliance) and asked, If there was a publication that would support the work you are doing or you would like to see happen in Chicago, what would it look like? They reported back and said, We want this to be local, we want it to be about practicesstuff people are actually doing in Chicagoand we want it to include writing at multiple literacy levels in one place since we are not able to make narrow assumptions about who our audience will be, because we want the full range of people engaged in struggling for a better, more livable Chicago to contribute [to] and use this publication and also to become its audience. That initial group of people were AREA’s first advisory group, and since then we have had dozens of people work as advisers and now there is a group of six COREdinators who are at the center of the organization. It felt like, at this time, that progressive and left politics and culture in Chicago were really fragmented and needed a device in which to see themselves in their full range of expressions, from more professionalized non-profits to grassroots militant campaigns and the kind of creative interventions with which I had experience. That fragmentation certainly persists but, I think five years after AREA was created, it certainly feels like there is more of a mutual recognition of people and groups from across cultural and geographic boundaries than there was before. It would be great if AREA helped out with that development in some way. I really think that it has been a unique experiment in media-making that privileges networking and community-building alongside the more conventional role of documenting and recording history. TMN: Why do you think it’s time to distance yourself from the organization? DT: With what I’ve already explained, the goals of AREA are quite ambitious and were and have been determined through a collective process. So it has always been a space for other people’s visions. But all initiatives require some kind of starting point and my initiative was that starting point in terms of getting people together and doing lots of the legwork as an administrator and the editor for the first two years. 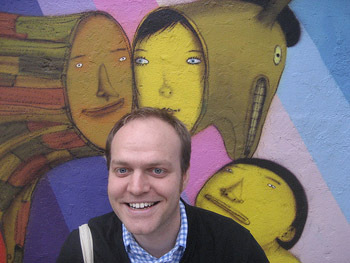 Then in 2007 we started having guest editors who were particularly experienced in one field or subject, starting with the researcher and organizer Ryan Hollon, who used his extensive networks to develop the fourth issue of AREA on the theme of criminal justice and prisons as they were being addressed by activists, grantmakers, philanthropists, school teachers, churches, social workers, and artists throughout Chicago. It was a great issue and a transitional time for the organization because we finally figured out how to start letting this media platform of AREA be used by people operating in different fields. Since then I have been slowly stepping back out of my leadership role, and other folks have been stepping up and taking the lead on organizing events and publications. This was my hope all along, that I would step out my role and others would be able to utilize it to address challenging questions or ideas that they saw as relevant and worth digging into. The process of editing an issue of AREA is a huge undertaking (there are two large newsprint issues per year, with about 50 contributors each time) because it involves lots of trust-building with people who are very busy, and stretched thin as hardworking community members, and working to convince them that sharing their story through AREA would benefit them and their work. So a lot of the contributors are first-time authors or people who have never taken the time to write a reflection on the work they do trying to make Chicago a better place every daybut those stories are really inspiring, and it is so much more interesting if it can be told in their words, either through their own writing or through a long-form interviewwhich AREA has really focused on since the beginning. So I wanted to continue to make room for other people to have these rewarding experiences guiding and leading AREA, and it became apparent that as a founder I had a disproportionate amount of knowledge about the inner workings of the organization, ranging from editorial policies to relationships with funders and contributors. So when other people started to step up within AREA, I realized that I needed to fully extract myself from the organization to allow all of that knowledge to be passed along to others instead of being a backseat driver. There are just so many dysfunctional nonprofits and media projects out there that are overly reliant on one person’s energy, or where the founder has founder’s syndrome and cannot share or redistribute power in a way that respects other people’s abilities or the mission of the organization. I didn’t want to be one of those jerks, and so I wanted to step out and move into working on new projects and let some of the really energetic, ambitious, and skilled artists, activists, and educators that AREA had drawn in over the years really take the project in new directions. So in 2009 I announced I would leave AREA after the 10th issue and we began a process of doing some institutional-knowledge transfer and training of new folks and figuring out how to run the organization in the future in a more collective manner and not one that had a disproportionate dependence on one person, as it had with me in the early years of AREA. The 10th issue was released on Oct. 1, and it was a great collaborative effort with me and five other editors, about half of which were first-timers and the others who had experience editing AREA or other magazines. It’s a great issue and a great note for me to end my tenure on. I am really excited to see where the current advisory group members of AREA and the new folks they bring in to collaborate will take the organization. Next year the two issue themes they have announced are Immigration/Migrations (Spring) and Intersections (Fall). TMN: Regarding your book Farm Together Now, what’s wrong with the way our food system currently works? DT: To put it simply I’ll have to quote Joel Greeno from Kendall, Wis., an activist-farmer I interviewed last year for the book, and he says, Corporate agriculture is not in it for quality. They’re not looking out for the consumer or the farmer; they’re just in it to make money, pure and simple. And Joel is right. The logic of the food system just mirrors the logic of all capitalist, efficiency-oriented, speculative markets where people are encouraged to benefit from other people’s losses. But to be clear, the project of Farm Together Now is not about explaining what is wrong with the food system. That analysis is needed, and we are lucky to have some amazing people who are doing that work of describing the problem of the food systemmost notably Michael Pollan, but also other amazing folks like Christopher Cook, Raj Patel, Heather Rogers. For a long time now Frances Moore Lappe, Vandana Shiva, Wendell Berry, and Wes Jackson have been critically breaking down the complexity of the global food system from local farms in the U.S. to their counterparts in India and all over the place. Farm Together Now is about trying to build on that work and instead look at the people who are trying to create solutions to a broken system. TMN: How did you decide which groups to focus on as you wrote Farm Together Now? DT: Amy Franceschini, my coauthor, and I tried to identify people across the U.S. who represented some of the different tendencies and orientations happening under banners like food justice and sustainable agriculture. We wanted people who felt the food system was broken and were implementing their visions for what solutions might be, but who had different specific ideas about what that looked like and how to talk about it. Similar to AREA, this project has been about looking at a fragmented landscape of people who are doing great work but lack a coherent social movement that really advances in a coordinated way to transform society. So all the people we are looking at are really localized examples of potential solutions to the crisis of the food system, but it would be so much more profound when it becomes a real movement with demands, the ability to affect policy on an international scale, and the ability to control and distribute resources in a way that could add up to a real counter-model of what food from seed to farm to store to plate and back to the soilthe whole food chaincould look like. So we got interviews with permaculturalist medicinal herb growers in the mountains of North Carolina like Joe Hollis, food bank social-workers turned urban farmers in Atlanta like the Georgia Hunger Coalition, and the South Central Farmers, who were evicted from their land in L.A. several years ago and have recreated themselves as a cooperative farming endeavor in the rural mega-farm landscape of the San Joaquin Valley, creating a kind of urban and rural bridge for their community, which had previously sustained itself in what was called the largest urban garden in the U.S.
TMN: Can you give us a brief rundown of the trip? You actually crossed the country to get the material for the book, correct? DT: It was so amazing. I’ve always wanted to do travel writing, especially after 10 years of work that was really concerned with Chicago. So it was nice to get out and see some new places. While the book isn’t quite structured like a travel book, it still has a bit of that feeling of movement and of the importance of different places in people’s lives from the Intervale Center in Burlington, Vt., to small cities like Santa Cruz, Calif., and Portland, Ore., on the west, and the amazing terrain of the San Luis Valley in southern Colorado and Union Pier, Mich., in the vast and amazing in-between. Amy and I divided up the 20 total interviews and visited 10 each with our collaborating photographer Anne Hamersky, visiting a total of 16 of the farms, and had local photographers, family, or ourselves filling in on shooting the other farms. The photography, combined with the farmer’s rich descriptions of their land and bio-regions, really gives you a sense of the complexity of this country we live in. It is daunting to think of how to address social and economic problems on such a large scale in such diverse and different contexts, but I really think that the 20 groups and individuals featured in this book point towards a much brighter future.